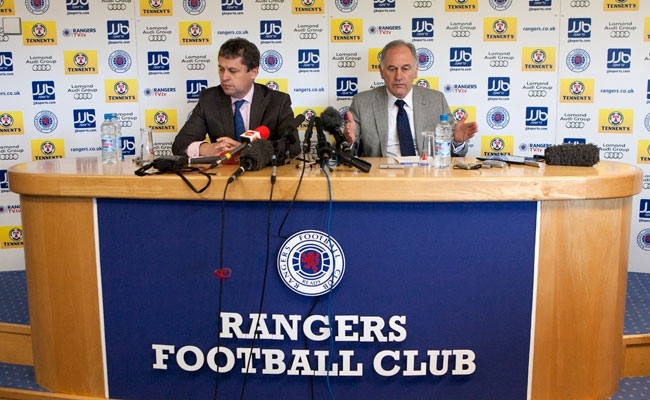 Nevertheless, the manner of this victory will give away fans who were here to see it as much encouragement as news Charles Green’s consortium is due to take control of the club. This particular Sunday began with a press conference to announce a deal has been agreed for the former Sheffield United chief executive to head a takeover during an exclusivity period. The specifics of how exactly that will pan out will become clear in the weeks ahead as a CVA is sought. In the meantime, it seems the club’s future is a little brighter and more secure after three months of uncertainty during the administration process. From that point of view, it appears there is much for Light Blues supporters to be upbeat about. And the way their team beat St Johnstone through Sone Aluko’s first career hat-trick and Lee McCulloch opener was just as pleasing. Scores of Ally McCoist’s players have queued up to say they wish to be at the club next season, Carlos Bocanegra, Dorin Goian and Steven Naismith amongst them. Without them and the likes of captain Steven Davis, this was still a strong performance against a side which was needing three points to qualify for Europe. And if those who say they want to stay can be retained along with those who haven’t said so publicly yet, the manager will certainly have a squad he can achieve things with. Sasa Papac and Kyle Bartley will leave, with question marks surely hanging over Kyle Lafferty’s head too. But with likely investment in the squad if it is required – and permitted – plus a good pool to begin with, Gers can be much stronger next term than many suspected a few weeks ago. With Bocanegra and Goian both allowed to end their seasons early, a three-man defence was comprised here of Bartley, Ross Perry and Kirk Broadfoot. Alejandro Bedoya also came into the team after impressing recently, with McCulloch and Aluko teaming up in attack. Saints made a lot of the early running as they chased a win which might send them into next season’s Europa League. And with Celtic moving ahead early against Hearts, the Perth men pressed for an opener to give themselves a chance of moving into fifth place in the table. Cillian Sheridan had their best opportunity in the opening exchanges but his header from a left-wing corner was well saved by the alert Allan McGregor. Francisco Sandaza also fired a free kick straight into the wall after doing well in the first place to win the set piece 20 yards out. Back came Gers, with McCulloch forcing a good save from Alan Mannus as he chased a long ball out of defence and managed to get a head on it against the odds. Bedoya then fired over the bar after good build up play involving him and Aluko, with the final effort always rising when it should have been kept down. It wasn’t to be long before Rangers broke the deadlock though and it was an excellent strike which made it 1-0 from captain for the day McCulloch. After latching on to a flicked ball, he turned and bent the ball around keeper Mannus to claim his fifth goal in his last 13 appearances. Lee Wallace soon had an opportunity to make it two after some good running on the left but his shot took a deflection and it ran wide. Gers were starting to pull the strings and McCulloch might have had a penalty while Bedoya didn’t connect properly three yards out but was offside in any case. Kyle Bartley also put a header over after Rhys McCabe shot into the ground bounced back up again and the visitors finished the first half with a flourish. The Light Blues continued in the same vein after the restart, with a lung-bursting 60-yard run by Bedoya ending with his on-target shot being diverted wide. 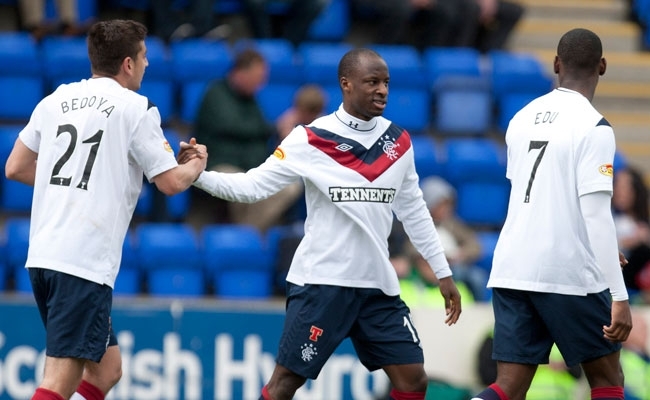 Maurice Edu then tried to tee up Aluko but the ball was nodded beyond him just as the Nigerian looked set to net. The former Aberdeen winger wasn’t to be denied, however, and 10 minutes into the second period he did make it 2-0. Again Edu was the supplier and Aluko made no mistake with a composed strike past Mannus as he took his goals tally for the campaign into double figures. 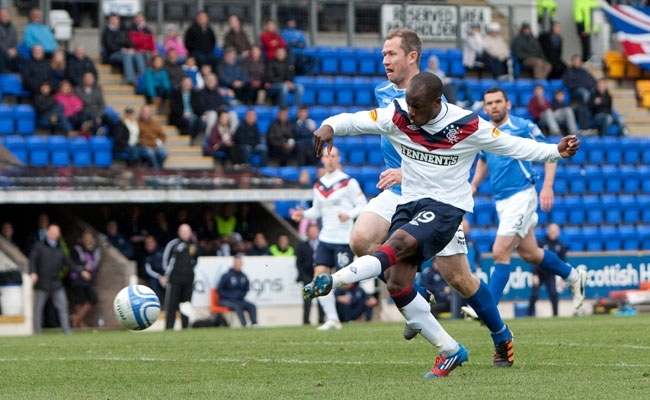 Moments later it was three as Aluko tapped in his second from close range, just 11 days after notching the very first brace of his career against Dundee United at Ibrox. This time Bedoya was the provider after good link-up play with Steven Whittaker – a promising right-sided partnership, incidentally – down the flank. With that, the game was over as a contest and the travelling fans – with a certain Nacho Novo in their ranks for the afternoon – celebrated accordingly. And with 17 minutes to go, there was more for them to cheer as Aluko completed his treble with a ruthless finish after Edu’s initial attempt was blocked. It was now a case of how many as Gers poured forward in great numbers every time they gained possession. They threw on Barrie McKay for his competitive debut and he might have struck five days after a goalscoring first senior appearance at Linfield had he been a touch stronger. 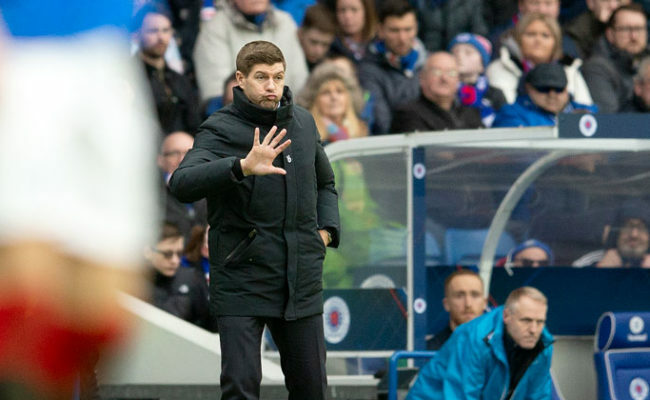 It wasn’t to be, however, and it remained 4-0 until the end as Rangers rounded off a run of run of six wins in their last eight games in style. Sorry, the gallery is currently unavailable.